Due out in October and November, respectively. 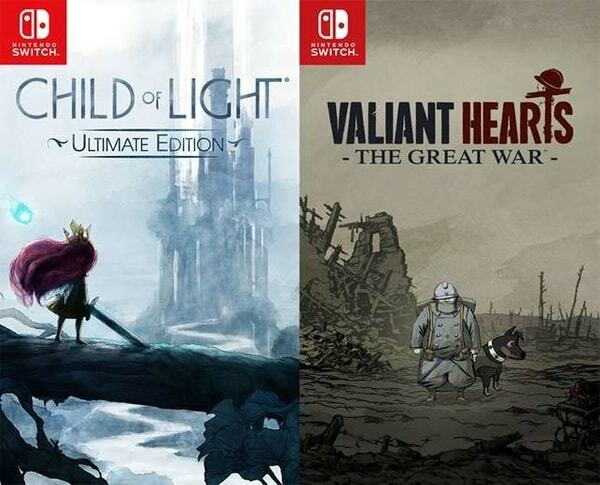 Ubisoft is bringing Child of Light and Valiant Hearts: The Great War to Switch. the company announced..
Child of Light will launch first on October 11, followed by Valiant Hearts: The Great War on November 8. Child of Light is currently available for PlayStation 4, Xbox One, PlayStation 3, Xbox 360, Wii U, PC, and PS Vita, while Valiant Hearts: The Great War is available for PlayStation 4, Xbox One, PlayStation 3, Xbox 360, PC, iOS, and Android. Find overviews of each game below, via their Steam pages. An Adventure Waits! – Created by a talented team at Ubisoft Montreal using the UbiArt Framework, Child of Light is an RPG inspired by fairy tales complemented with a story carefully crafted in verse and rhyme. Step into a living painting, the breathtaking scenery of Lemuria is an invitation to explore a long lost world. Enter the World of Lemuria – Across your journey through Lemuria you will encounter many eccentric creatures, from spirits of the forest to talking mice to wicked witches and evil sea serpents. Discover a vast land with iconic locations and exciting dungeons that will evolve as Aurora regains the stolen lights. Fight the Dark – Battle enemies using an Active-Time Battle System alongside the firefly Igniculus and other members of Aurora’s party on their quest to recover the sun, the moon and the stars. Beat your enemies using a deep party system and the varied skill trees of your party. Play with a friend as both Aurora and Igniculus using the seamless drop-in drop-out cooperative multiplayer. An animated comic book adventure – From the green forests of the French countryside, to dank trenches and snowy fields, go back through history in this emotional adventure game delivered with a unique tone and art style. A mix of exploration, action and puzzles – Move into action and help your heroes survive the Great War by solving puzzles or sneaking through enemy lines… live a touching and comical adventure. Follow the stories of these Valiant Hearts… – Lost in the middle of the trenches, play each of these characters and help a young German soldier find his love! … And their faithful canine companion – With the help of your trusty companion’s canine sense of smell, send him through barbed-wire obstacles and shell holes to solve puzzles or avoid enemies… Rely on him: this dog will be your best friend! Relive the Great War – This fictitious story takes you back to famous World War I locations, like Reims or Montfaucon, revisiting historical battles on the Western Front, such as the Battle of the Marne or the Battle of the Somme! Powered by UbiArt Framework – Valiant Hearts makes the most of the UbiArt Framework and its motto “Bringing Art to Life”. This powerful engine provides the ability to transfer creative concepts and bring them to life in video games. A team of senior artists at Ubisoft Montpellier – Small is beautiful: a small but highly talented team, including the Audio and Art Directors of games such as Beyond Good & Evil and Peter Jackson’s King Kong, and key level designers on Rayman Origins and Rayman Legends.